The sudden appearance of this column may appear jarring to the casual onlooker. 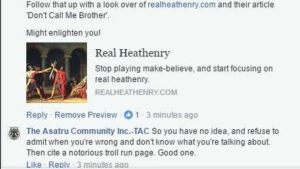 Indeed, Real Heathenry is a site ostensibly aimed at explaining the frequently slippery foundational ideas of the Heathen worldview, and the addition of a section clearly built to perform exposé may initially seem off mission. It is becoming ever clearer, though, that much of the misinformation Real Heathenry is built to combat originates directly from these toxic voids, these “National Heathen Organizations.” While the particular ideologies and splash art may differ, the tactics of these groups are strikingly similar. Poorly made memes abound, often with purloined art. Cherry-picked and misunderstood quotes adorn them in support of some dated, ludicrously incorrect, or racist idea. These are shared to as many groups as possible, likes are generated, t-shirts are sold, and that sweet, sweet internet money rolls in the door. While practically all of the “national orgs” follow this prescription, there is none more disingenuous or wholly without worth than “The Asatru Community, Inc.” Incorporated early in 2016, The Asatru Community (or TAC as it is commonly called), packs all of the worst behaviors of the other Orgs into one bizarre box. Apart from their incredibly poor material, TAC exhibits constant lapses of judgement which range from almost farcical mismanagement to sinister message control and explicit bigotry. For this reason, we have chosen to honor TAC in the best way we know how: we’ve named this section specifically for them. Eventually, TACwatch will branch out, and begin tackling the poor behavior of other national orgs. Since, though, the enormous majority of our opening material will be devoted to cataloging the many missteps of The Asatru Community, we felt it appropriate to ensure that this effort to “keep ’em honest’ should forever be graced with its inspiration’s name.